I began my project @SocialLit by writing poems that were exactly 140 characters to make the argument that Twitter functions as a new medium for literature and necessitates unique poetic forms. As a medium, I envisioned Twitter being a space for writers to collaborate seamlessly and create pieces together regardless of where they are physically located. This turned out to be the most difficult part of the project. But rather than try and generate interaction, I kept writing poems and replying to the occasional person who’d tweet to @SocialLit. It became evident to me that while I kept purporting this vision of collaborative writing, I never actually laid out any guidelines for what exactly I meant. I was tentative about defining anything, because I wanted the work to happen organically, but the truth is: nothing can grow if you don’t do some tilling first. So I decided to launch the experiment #SocLlit to test out writing a collaborative poem on Twitter and to provide an example as to how it might be done. Before beginning the hashtag on December 28th I sent out Facebook messages and emails and posted Facebook statuses asking for support in this project and explaining what I had in mind. American art often idealizes the rugged individual, stubbornly creating something all on their own, but I haven’t found this to be the case. It took my friend Bobby Crawford (@BodaddyCrawfish) to write a response to my initial @SocialLit tweet for the hashtag to really open. #SocLlit never would have been possible without the seventeen people willing to participate, let alone the countless others who shared, retweeted, and promoted the project. People interacted in unexpected ways, like my friend Allison Truj (@AllisonTruj) who basically functioned as co-facilitator by retweeting or favoriting every piece written and keeping the hashtag active throughout the course of the day. I consider #SocLlit a huge success, for the simple reason that people did, in fact, write and work together towards making a single piece of poetry. There were some small blips, such as people tweeting #soclit instead of #SocLlit. This was an oversight on my part, as the two Ls are difficult to read together. If I noticed people tweeting from #soclit though, I simply @tweeted them with #SocLlit so that the conversation would appear in the thread. I chose #SocLlit because #sociallit, corresponding to my project’s handle, is currently taken by a new Stanford class and since twitterspeak is an integral part of the project, I wanted to use Social Literature in twitterspeak. The capital L at the end of “social” represents the phonetic spelling of the word and the “literature” portion stands alone as lit. In the future I’ll pick a clearer hashtag, but for this experiment I was just excited to find one that fit the project title and that no one else had used. I also think that further research into the nitty-gritty aspects of Twitter will be beneficial for future efforts, learning about Twitter’s search algorithms and how exactly private and public accounts interacting affects the visibility of tweets will help smooth out the process. Initially I imagined the collaborative writing being done through @tweets, where one long series could be read as a conversation on Twitter, but it was soon made apparent to me that this wouldn’t be the best way to approach it. @Tweets are visible to fewer overall Twitter users than hashtags. Additionally, most of the tweets were directed at my accounts rather than at other people using the hashtag, causing more leg work on my end to try to connect users. The Twitter handles, once they started including multiple people, became unwieldy, limiting the number of characters a user could write. The future of this project will use hashtags like titles or themes, so that every individual can contribute to the poem itself simply by using the hashtag. The organizing method of Twitter, placing more popular tweets in a hashtag first, can become a strength in this format allowing for the creation of a poem that is fluid, always shifting depending on which tweets are favorited and retweeted by viewers, truly giving readers control over the interpretation of a text. In #SocLlit I already saw this happening on a small scale and I would like to further investigate how it affects the direction of the poems overall, as what I initially thought would be linear turned out to be more of a treelike progression. This hashtag use will also open up an opportunity for creating micro poems within the greater poem of the hashtag. While @tweets were an unsuccessful tool for unifying numerous people, if a user reading through finds another writer whose work they admire, then @tweets can be used to contribute to the poem on a personal level, as if the two users are creating the subtext of the piece by exploring portions that are particularly evocative to them. I would also like to use the hashtags as part of a larger digital narrative, maybe linking them across different platforms, since hashtags can be used synonymously on Facebook and Instagram, as well as Twitter. The fact that #SocLlit was a success invites the possibility for a global poem. The people who participated crisscrossed North America, tweeting from Calgary, Alberta to Phoenix, Arizona and Portland, Oregon to Boston, Massachusetts. As a project, @SocialLit is about uniting people through poetry and while the first collaborative effort stayed on this continent, I hope future poems will one day connect people all over the world. I want people to write together so that we can better understand each other. There’s a willingness to discuss the ways our world is shrinking because of technology and the problems that arise from it, but people often neglect to address the potential solutions there as well: maybe the disjointed nature of twitterspeak will help us discover commonalities in disparate languages, maybe social media sites like Twitter can offer different cultures a candid glimpse into each other’s daily lives, maybe a few people writing together on the internet from warring countries can end a violent conflict. For now, the immediate hope is that people will start trying out #SocLlit on their own, coming up with hashtags and writing together, and in doing so continue the ancient practice of using poetry as means of connecting to one another. 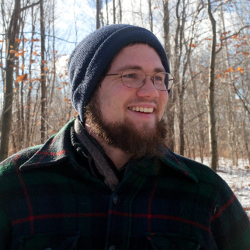 Donald C. Welch III currently lives in Brooklyn, NY, but started writing in Mooresville, NC. His project @SocialLit explores new forms of poetry and collaborative writing derived from Social Media. His work has appeared or is forthcoming in Passages North, Haiku Journal, War, Literature & the Arts, Foliate Oak Literary Magazine, The Emerson Review, among other journals. South85 Journal published his poem, “Finding Myself in a Wendy’s in Clyde, North Carolina,” in its Fall / Winter 2014 issue. His collection of children’s poetry Who Gave These Flamingos Those Tuxedos? was published by Wilde Press.